At Weston Racquet Club we are committed to providing a safe and enjoyable environment for learning tennis; a sport which can be played for a lifetime. We have established the following policies which will help the club and its members all enjoy the learning experience. b. You must register your child for the Make Up and our 24 hour cancellation policy applies to this event. c. If a child is dressed inappropriately, the parents will be notified and the child will not be allowed to participate in the class. a. Demo racquets are for short term use, children need to have their own racquet to participate. b. If you are unsure of what size racquet your child needs, please speak with your child's instructor. a. Parents can view their child's class from the viewing lounge. Parents are not allowed on the courts during their child's instruction. b. If you need information on how your child is progressing in class, please feel free to contact WRC's junior program coordinator. a. Every effort will be made for the same instructor to teach a class court for the duration of the season. However the club may substitute when circumstances arise which are beyond its control. a. Good sportsmanship is encouraged and expected at all times, proper tennis etiquette will be taught during class. b. Bad behavior, language, or abuse of equipment/facilities will be addressed by the instructor on court and communicated to the child's parents after class for remediation. c. Be respectful of others. Bullying and name calling in any form will not be tolerated. d. Always be safe. Do not participate in any behavior that would risk injury to anyone else, such as throwing or hitting balls (when not asked to), throwing your racquet or any other object on or off the courts. None of these behaviors will be tolerated. e. Demonstrate a positive attitude. Do not use any foul language, mock, tease, argue or complain to any other player or coach. 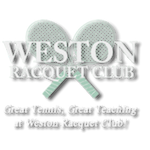 Weston Racquet Club – Great Tennis, Great Teaching!